Born in Oita, Mayumi started learning koto and shamisen in her early childhood, studied under MIYAGI Kiyoko, a national living treasure, and graduated from Tokyo National University of Fine Arts and Music. 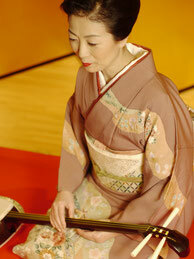 Since then, she performed in many recitals in Japan and overseas. She is licensed by Miyagi group of the Ikuta School, and Master of Fujimi-kai.